Manchester United executive vice-chairman Ed Woodward has reportedly chosen the man he wants to become the club’s director of football – and is keen to get the appointment in place before the club decide on their next permanent manager. Disagreements between Jose Mourinho and the board’s willingness to fill the newly-created role were thought to be one of the key factors behind the club’s decision to part company with the Portuguese boss last month. Multiple disagreements over transfer targets and a string of bad results probably didn’t help much either! Since being replaced by Ole Gunnar Solskjaer, United have won seven matches in a row, making the Norwegian the outstanding candidate to take the job on a permanent basis. A report last week claimed Solskjaer was now Woodward’s No 1 contender to fill the role over the long term. However, before making a decision on whether to hand Solskjaer the reins on a full-time basis, Woodward first wants to get his director of football in place – and there now appears to be a clear contender to take the vacancy. United had first been linked with Roma’s respected sporting director Monchi, while former Juventus CEO Giuseppe Marotta and current Old Lady sporting director Fabio Paratici were also thought to be in the frame. 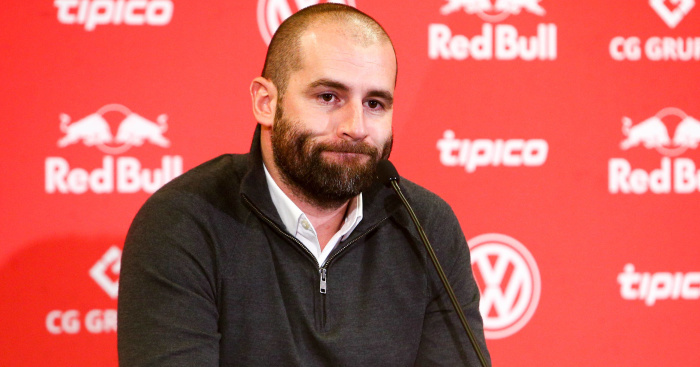 However, The Independent – who were first to break the news about Solskjaer’s appointment as interim manager – now claims United are readying an approach for RB Leipzig’s Paul Mitchell. Manchester-born, Mitchell made his name with Tottenham before switching to the Bundesliga with Leipzig, where his reputation has continued to soar. And it’s Mitchell’s eye for a player and scouting skills which is said to have drawn United to Mitchell. Mitchell was questioned about the possibility of taking United’s director of football role in October when he was first linked with it – and he was not ruling it out. “Manchester United are recognised for being one of the biggest clubs in the world,” he told The Sun. “There has been any contact with United at this moment, for me it’s always about focusing on the job in hand. Should they fail to strike a deal with Leipzig for Mitchell, it’s believed United would instead approach Edwin van der Saar, their former goalkeeper who has performed a similar role with Ajax to great success in recent years. Whatever the decision taken, it won’t take away from the significant choice Woodward must make on United’s next full-time manager. Solskjaer’s willingness to work with the new model also adds additional appeal for Woodward, though the paper adds that one of finishing in the top four this season and/or beaten PSG in the Champions League last 16 are seen as potential game-changers in the process of hiring the next full-time manager. The post Man Utd decide on director of football as Solskjaer is set target appeared first on teamtalk.com.